A quiet update this morning to the Apple TV, seems to indicate a pretty big change in strategy. Of course, Apple would never frame it this way, but with the emphasis now squarely back on purchases, it seems pretty safe to say that the television show rental model was a failure. To be clear, there are still rentals available on the device. But it’s the same limited selection of shows that have been in place for months now — Glee, Bones, 24, etc. And Apple doesn’t even have a section anymore highlighting which shows you can actually rent. This is a big departure. Previously, you could only rent TV shows on the device. This was a bit odd since Apple has much more TV content available to buy. But in order to get it, you had to buy it on your computer (or iPhone/iPad/iPod touch) and then stream it to the Apple TV . That’s no longer the case. 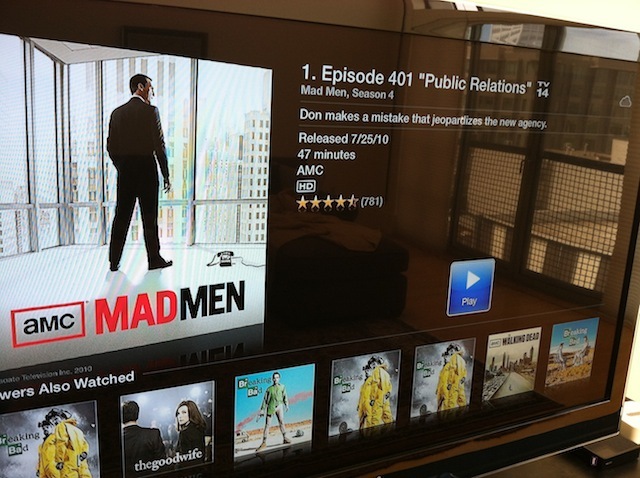 The update to Apple TV today brings the ability to purchase any TV content available on iTunes. And you can also easily access content you’ve previously purchased via the cloud — though it looks like the shows are still in the process of rolling out, as John Gruber points out. To be fair, perhaps Apple had this in mind for some time. Because the latest Apple TV model only comes with enough storage space for buffering, TV purchases previously did not make sense. 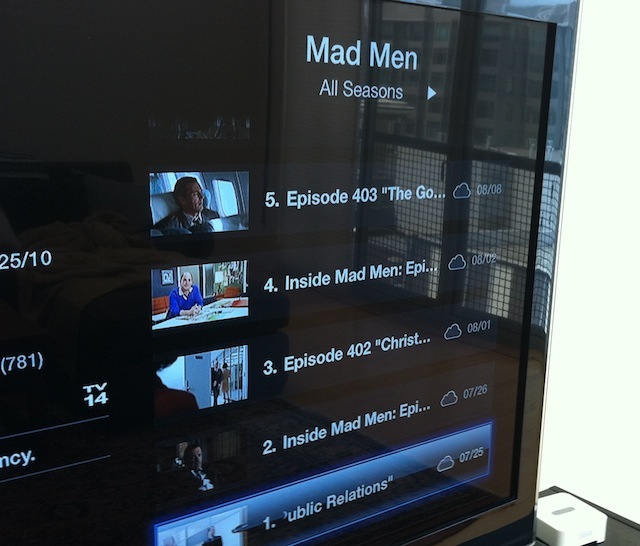 But with iCloud, content can now be streamed directly from Apple’s servers to your Apple TV. This works beautifully. I just purchased a season of The Wire from the Apple TV and nothing actually needed to download. It was only when I clicked on an episode to watch it that the device began calling for it from the cloud. One has to imagine that this model will come for movies as well. Though for right now, movies are still rental-only on Apple TV. Interestingly enough, my purchase of The Wire didn’t download the entire season anywhere, not even iTunes on my computer (though I can download it there now if I choose). This also points to the future of iTunes. I’ve been saying for a while that it’s not music, but video that is an untenable model for the service. Because HD versions of movies and television shows take up gigabytes of storage, the more you download, the more likely you’re going to run out of room even on standard desktop computers. Full seasons of HD TV shows can easily take up over 50 GB of storage. Again, that’s just one season of one show. At some point, the only way that works is in the cloud with an unlimited amount of storage. And when you need to pull something down to take it with you, you can do that. That’s the model Apple now has in place with the television change. My colleague Matt Burns calls this a full assault on the cable box, and the first real move by Apple to take the Apple TV beyond a “hobby” device. I agree, this is step one in that direction. But in my view, this move is even more about transitioning iTunes to the right model to be able to fully utilize iCloud. Apple TV is coming along for the ride, and is the perfect front-end to show how this change will work. And it shows just how much TV rentals did not work. It was a year ago that talk began to circulate about Apple attempting to convince the networks to do $0.99 TV episode rentals. It sounded great, but it ended up being far from great because only Fox and ABC got on board. Unlike music, books, movies, and even TV show purchases, where Apple has started with a few partners and gotten all the major partners on board eventually, that didn’t happen with TV show rentals. The overall selection was far too limited for the model to ever take off. Today’s Apple TV update seems to be a full admission of that.